Wanda Landowska (photo above) died on 16 August, 1959 in Lakeville CT. She was born in Warsaw in 1879 and studied in Warsaw and Berlin before taking up a teaching position at the Schola Cantorum in Paris at the age of just twenty-three. The harpsichord manufacturer Pleyel had exhibited an iron-framed instrument at the 1889 Paris Fair and, at her request, they manufactured a custom harpsichord for Landowska to use in large concert halls. With its massive cast-iron frame, numerous stops and sixteen-foot register the instrument’s only link to the classical harpsichord was its name. But Landowska’s highly inauthentic Pleyel is probably responsible for the popularity of the authentic harpsichord today. 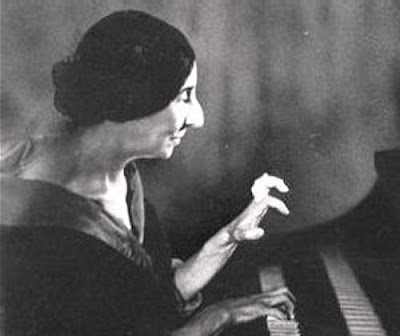 Landowska is remembered for her pioneering advocacy of Bach, and in 1933 she gave the first complete modern performance of the Goldberg Variations on a harpsichord. But she balanced her early music activities with contemporary music and Manuel de Falla’s 1926 Harpsichord Concerto and Francis Poulenc’s Concert champêtre were written for her. She fled from France before the German occupation of Paris in 1940 and settled in America. She recorded the Goldbergs and both books of the Well-Tempered Clavier for Victor in the 1950s at her home in Connecticut and these recordings are highly recommended in their current ultra-low price releases. Forget about authenticity or fashions. Landowska's Bach is sensational music making. Her attacking style coupled with the iron-framed harpsichord and constrained sound quality means this is an much John Cage (who died exactly thirty-three years after Landowska on 12 August, 1992) as Johann Sebastian Bach. An important historic document, great fun and essential for any CD collection. Now read about another great musician who has fallen victim to fashion. Nice summary, but John Cage died 33 years after Landowska... not three..
Too many anniversaries on 16 August - more haste less speed. Did Landowska not famously quip about Gould's 32 Variations recording: "he plays Bach his way, and I play it Bach's way!"? There is an amazing, if not somewhat chilling, recording of Landowska playing D. Scarlatti, where one can hear the distinct thunder of ack-ack fire in the background. Ironically, it was a fairly "militaristic" Sonata! It was as a response to Roalyn Tureck :""You play Bach your way, and I'll play him his way." "When I hear Glenn Gould, I say, he understood nothing to Bach (sic). An artist who doesn't show himself in public has a problem. He's so much off-target that you'd need a 747 to take him back." "Glenn Gould never knew what's a harpsichord (sic). Landowska never knew what's a harpsichord. Horowitz never knew what's a harpsichord. I know I'm uttering heresy after heresy, but things ought to be said the way they are." Came to this old post from your latest link, which I followed because I love Landowska! And glad you do to. In response to an earlier comment, it was not Rosalyn Tureck who was the target of Landowska's quip. According to Denise Restout, Landowska's student and partner, Landowska actually said this famous quote to Casals. Restout, who said she was there at the time, wrote this in a letter to Clavier magazine some years ago; I saved it and can dig it up if you are interested in a screen shot. Or maybe it is on JSTOR or some such database.